Time flies when you you’re having fun…right? 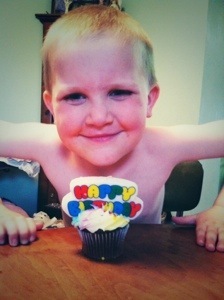 It’s hard to believe that just a few short weeks ago my little George turned 5. How is that even possible? It seems like just yesterday I was spending countless hours at various physicians, trying to nail down what was going on…wondering where his road would lead. Yet, here we are. Five. For those that don’t know, or maybe haven’t been following along, or are new to this blog, 5 is a magic number for my George. It’s an age that science said he more than likely wouldn’t reach. It’s an age that should have brought more issues and concerns and perhaps a little more doom and gloom. George broke down the door of 5 and is rarin’ to go. He’s excelled at preschool and may need some advanced work when he hits kindergarten in the fall. Kindergarten. A dream I dared to dream. It seemed like eons ago that I wrote about finally realizing I needed to give George a life. Not just health…a real life. One filled with friends and experiences and ups and downs. And since then, I started living too. Do I still worry about tomorrow? Certainly. I don’t know of a single parent that wouldn’t. But why borrow the trouble of tomorrow against the miracle of today? My guard is still up. I read about the measles outbreaks across the country and the hair on the back of my neck stands on end. I do what I can to protect George from the known issues that he may face. But I could never fully protect him. There are too many unknowns. Too many variables. So I must use a little common sense and balance. Five whole years. It seriously feels like a lot longer than that. But if we truly lived by the adage that “it’s not the years, it’s the miles,” George would be older than most. Blessings come in all shapes and sizes. My greatest blessing just so happens to come in a dynamite little package that keeps thumbing his nose at what the experts say. Just goes to show that the greatest Expert of all doesn’t follow a scientific journal. This entry was posted in About me, Boys and tagged birthday, children, miracles by wagfarms. Bookmark the permalink. Happy Birthday George! Bless you! Happy Birthday George and Blessing to Your Family! I love to hear that he’s taking 5 by a storm! I wasn’t sure this day would ever come…but I can’t wait to see what tomorrow brings!